If you are too busy to play with a Kombucha mushroom and find it easier to buy Kombucha at the health food store, fair enough. 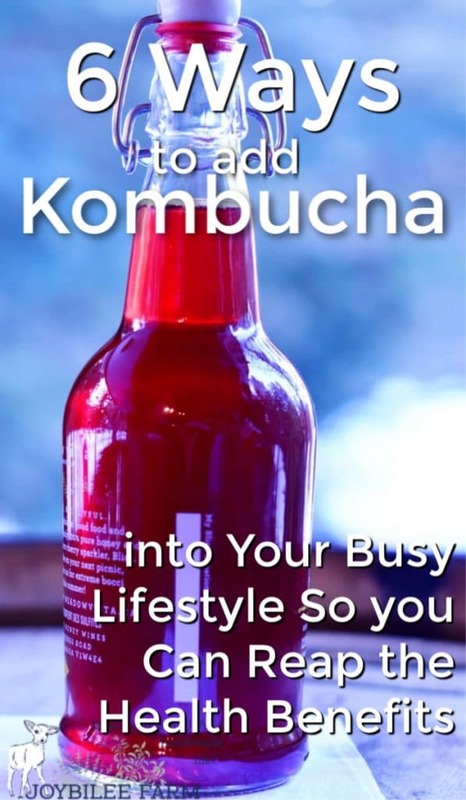 Should you decide that you want to fit Kombucha making into your busy lifestyle, here are 6 tips that will help you drink it every day. 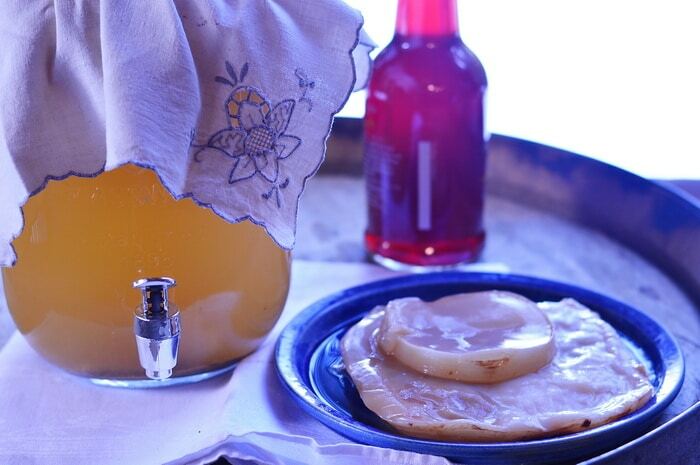 Kombucha is a healthful, tonic drink made from tea, sugar, and symbiotic bacterial culture. Kombucha benefits are plentiful. Kombucha has a reputation for preventing and curing cancer, regulating blood sugar, lowering blood pressure, and improving heart health. It is also used as an aid to weight loss. It increases stamina and refreshes. 1. Make the tea after dinner. A homestead kitchen is a busy place during the day. Who wants a glass pitcher of tea sitting on the counter in the way of dinner preparation and cleanup? Before you can make kombucha and add the mushroom or scoby, the hot tea has to cool until it’s no longer warm to the touch. Its hard to time it just right so that it is cooled and the job can be completed before bedtime. Solve this problem by making your Kombucha tea after dinner while you are doing the clean up from dinner. The tea can steep while you do the dishes and will cool while you go through your other evening activities. About an hour before bedtime just transfer the cooled tea into a 2 litre/quart glass jar, and add one cup of kombucha tea from the previous batch. Gently place the scoby on top of the liquid in the jar. Don’t worry if it sinks, it will still work. Put a clean handkerchief on top of the jar and secure it with a rubber band. Put the jar away in a cupboard where it won’t be bumped and leave for 4 to 6 days until it reaches a pH between 4 and 2. It will be slightly fizzy and refreshing tasting. Bottled kombucha is fizzy and refreshing. 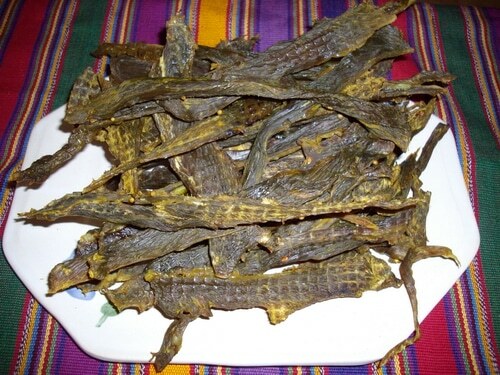 You can flavor it with syrup, spices, flavored herbal teas, juices, or even berries. Use 1 cup of juice to 7 cups of first ferment kombucha, or 1 cup of double strength herbal tea to 7 cups of fermented Kombucha. If you are adding fruit, just drop 1 tbsp of berries into each bottle and fill with fermented kombucha. Then cap and complete caps according to the manufacturer’s directions. 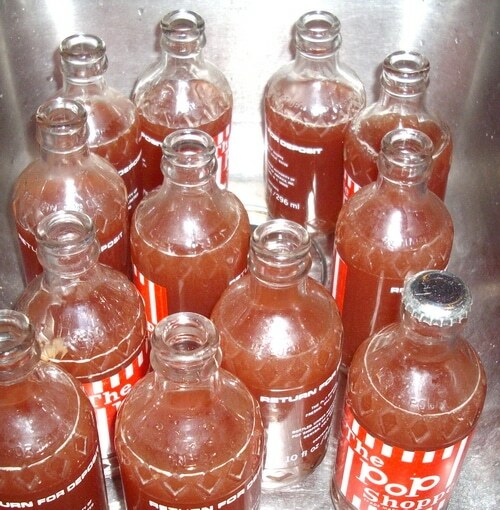 I have some antique pop bottles and beer bottles, so I use tin crimp caps and a bottle capper to bottle my kombucha. Leave these out at room temperature for 24 hours and then refrigerate. Bottled kombucha travels wells. Add a bottle to a bagged lunch, just don’t forget to add the bottle opener. You can travel with it in your briefcase pack some in a suitcase before you leave on a trip. Don’t bring it on the airplane in your carry-on luggage though, as it will exceed the liquid restrictions for domestic travel. Too busy to stop the fermentation and make bottled kombucha? You can ignore it for a few days and allow it to become more acidic. 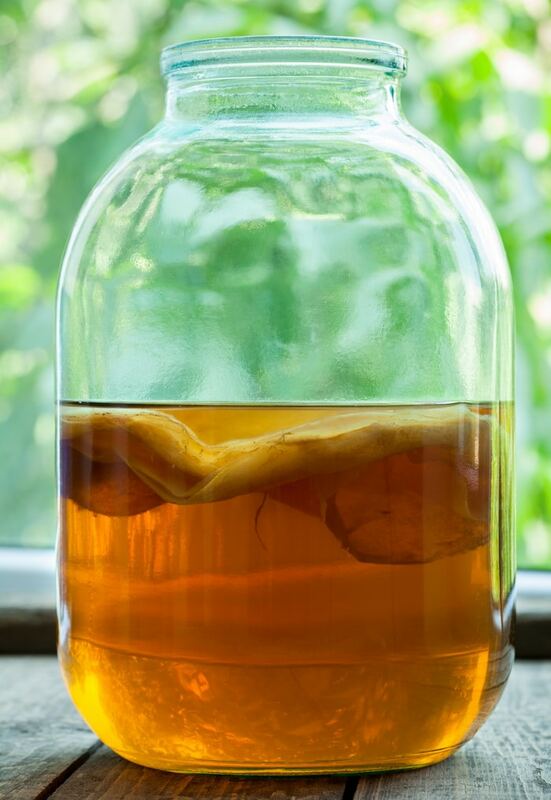 Even if it’s decidedly vinegary you can still use the scoby and one cup of starter for your next batch of Kombucha. It will become less acidic as it is diluted with the new batch of tea and sugar. Use the remaining Kombucha as a vinegar substitute. One of the components of Kombucha is acetic acid or vinegar. If you leave the Kombucha to ferment for a couple extra days, you can use it in place of vinegar in salad dressings. You can make this recipe the day before. It pares wonderfully with a spring green salad. Put kombucha and raspberries in a pint jar and allow to sit for an hour, until raspberries thaw and their juices infuse the kombucha. Stir briskly with a whisk or fork to break up raspberries. Pour mixture through a sieve to remove raspberry pulp. Add mustard and olive oil. Beat well with a fork until mixture thickens and becomes slightly opaque. Add minced onions and thyme. Beat well with a fork until spices are fully incorporated. Allow it to sit for an hour for the flavours to meld. Kombucha is the perfect vinegar substitute for marinading meat before it is being dried for jerky. The lactic acid and acetic acid in Kombucha add probiotics to the meat that overwhelm harmful bacteria and keep the meat from spoiling. The acid tenderizes the meat. Get my jerky marinade HERE. I am currently making 2 gallons of Kombucha every week. This makes 24 10 ounce bottles of 2nd ferment Kombucha. I don’t have room for 24 bottles of Kombucha in my fridge at one time. My Royal Berkey water filter doesn’t hold enough water to be able to make 2 gallons of tea at one time, either. Kombucha is one of God’s good gifts. Sometimes you can be just too busy to take care of yourself, but you know that when that happens, eventually sickness comes and forces you to slow your pace, rest, and take care of YOU. Kombucha is waiting for you to make the decision that your health is important to you. Make room for the ritual of making Kombucha once a week and drinking it daily, and you will reap the benefits of vibrant health and vitality. You deserve it. Make room for it.